Black mold is the most feared type of mold for residents in Southeast Wisconsin, and for good reason. Though black mold is a term several fungi fall under, the one identified as stachybotrys chartarum is the one to watch out for. This type of black mold produces mycotoxins, toxic substances causing havoc on the body. Black mold has the power to make the strongest person weak and sickly. All it has to do is move in with you. There’s another concern with this type of black mold infestation. The government has the authority to condemn a home considered hazardous. Black mold contamination IS hazardous and homes with it have been condemned. The conditions suitable for mold growth are warm, dark, and moist places in your home. Black mold is no different. 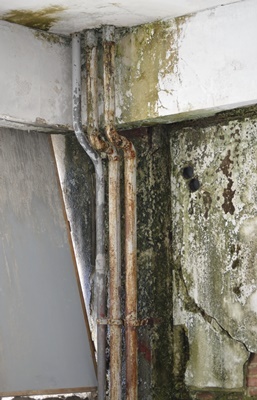 Water damage is another way mold will get a foothold in your home. If you’ve recently had flooding in your house, it’s possible black mold is growing at your house right now. Any of the above physical symptoms are signs of black mold. If you’re constantly getting sick at home, suffer from allergies, smell dank odors, or physically see black mold, then it’s time to call a professional. Surprisingly, just because a mold is black doesn’t mean it’s ‘black mold.’ The look of black mold is actually dark green mixed with black, sometimes even gray. Though the color may be put into question, the symptoms from exposure are the tell-tale signs. Don’t try to go remove black mold yourself. This is work for a professional. Trying to remove black mold actually risks spreading it. If you think you have black mold in your home, contact ERS immediately. We know how to remove black mold from your house without it growing back or causing any further problems. ERS has saved hundreds of homes from mold contamination and we’ll save yours too. Contact Emergency Restoration Specialists for all disaster restoration & Cleanup.